NEW: Win free admission, a Keepsake Package, or even a VIP Package: enter our HOLIDAY CHALLENGE contest today! NEW: Read Michael Steinman's blog post on Jazz Lives about the show and album! Very special guest tap dancer extraordinaire Andrew J. Nemr will be joining us! See below a mini-review of Christmas Stomp by Michael Steinman, author of music blog Jazz Lives! General admission (CU Student tickets are available at the door). Beat the rush and order your advance tickets here! In addition, we're offering a special deal of $20 for admission PLUS the new album - what a steal! Support the Stompers by checking out our admission packages, including goodies like autographed CDs, posters, photos, and more, available at right. Each package deal helps to support these fine musicians and the production of this album (a labor of love), and earns you points towards Santa's 'nice' list! Admission to the show, plus take home the new CD, at a one-time-only incredible discount! When nothing remains of Christmas merriment but the credit card bills, CHRISTMAS STOMP will keep on giving. Gordon Au and the Grand St. Stompers create music that will bring joy all year: frisky, full of feeling, innovative without being heretical. The Grand St. Stompers are creative joymakers. Their ensembles rock; their solos soar; the band can sound like the Louis Armstrong All-Stars then hint at Gil Evans or Forties Ellington. Sweet or tart vocals by Tamar Korn and Molly Ryan tie up the holiday package with a glossy bow. The music celebrates the season but it's nothing like the formulaic seasonal blare. No Rudolph, no drummer boy - just pleasure, ingenuity, and sly humor. The Stompers make wondrous dance music. Even if your six-beat count never gets beyond two, this CD will have you swaying and smiling. Admission to the show, and take home an autographed copy of the new CD plus a Christmas Stomp poster! Admission for you and your guest to the show, plus take home an autographed CD and autographed Christmas Stomp poster! 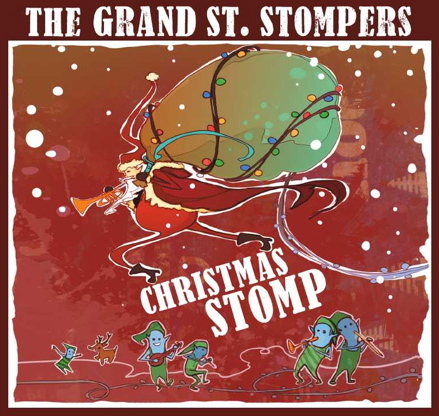 Admission for you and your guest to the show, an autographed CD, audiophile download, autographed Christmas Stomp poster, and a photo of the Stompers autographed by each member! Everything in the VIP Package, plus special recognition at the show, a photo of you (and your guest) on stage with the entire band, and your choice of either limited-edition memorabilia: a set of two Christmas Stomp mugs, or four Christmas Stomp cork-bottom coasters! Everything in the Patron of the Arts Package plus more; please inquire within.